A dental crown, which is also known as a tooth-shaped “cap,” is designed to completely encase the entire visible part of the tooth, which starts right above the gum line. 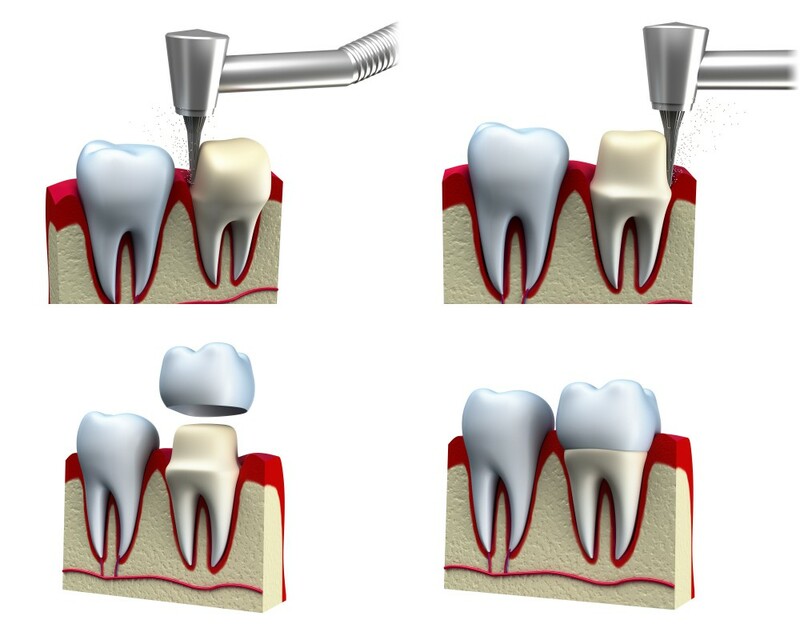 This is done in order to reshape, resize, and restrengthen the tooth, starting at the base. Why Select Dental Crown Treatment? There are various reasons why a patient may select dental crown treatment. It can effectively help to: protect and prevent a weak tooth from breaking (which may have been a result from decay), secure parts of a cracked tooth together, restore a broken or severely worn down tooth, cover and support a tooth that has a large filling and a minimal amount of the actual tooth remaining, keep a dental bridge in proper positioning, conceal a misshapen or dramatically discolored tooth, or to cover a dental implant. Are Crowns Intended to be a Permanent Solution? The lifespan of a crown really depends on various factors; however, dental crowns, on average, last between five and 15 years. It is important that you are mindful of the amount of “wear and tear” the crown is exposed to. In addition, be sure to follow good oral hygiene practices and be especially cautious of your mouth-related actions. This means that you should avoid such behavior as grinding or clenching your teeth, ice chewing, biting your fingernails, and opening packages with your teeth. At Dr. Naik’s Moreno Valley cosmetic and general dentistry practice, you have several options to choose from regarding the type of crown material you prefer to be used during treatment. You may choose from all metal, porcelain-fused-to-metal, all resin, or all ceramic. As for the difference between temporary crowns and permanent crowns: Temporary crowns can be made in the dentist’s office whereas permanent crowns are constructed in a dental laboratory. Temporary crowns are made of acrylic or stainless steel and are used as restoration until the permanent crown is ready for placement. The permanent crown will eventually be cemented into place. What Type of Special Care Does a Crowned Tooth Require? One may assume that because a tooth is crowned the underlying tooth is protected from decay or gum disease. This is not true. While a crowned tooth does not technically require any special oral care, it is important to follow good oral hygiene practices. This includes brushing your teeth at least twice a day and flossing once a day, and paying special attention to where the gum meets the tooth. Although there is no perfect alternative treatment for dental crowns, some individuals opt for a filling instead of dental crown treatment. While this may solve the problem as a quick fix, it does not prevent the need for a crown later on in life. This is because fillings do not give the same kind of protection to the teeth as crowns do. If a large portion of the tooth needs filling, a better solution is a crown. This is because a complication may develop if the filling is too large – the tooth may break rendering it beyond repair. Another option you may want to consider is having the tooth extracted, and then having an artificial replacement tooth implanted. However, because neighboring teeth tend to shift when a tooth is pulled, misalignment of the teeth could develop, which can lead to chewing difficulty and/or jaw problems.